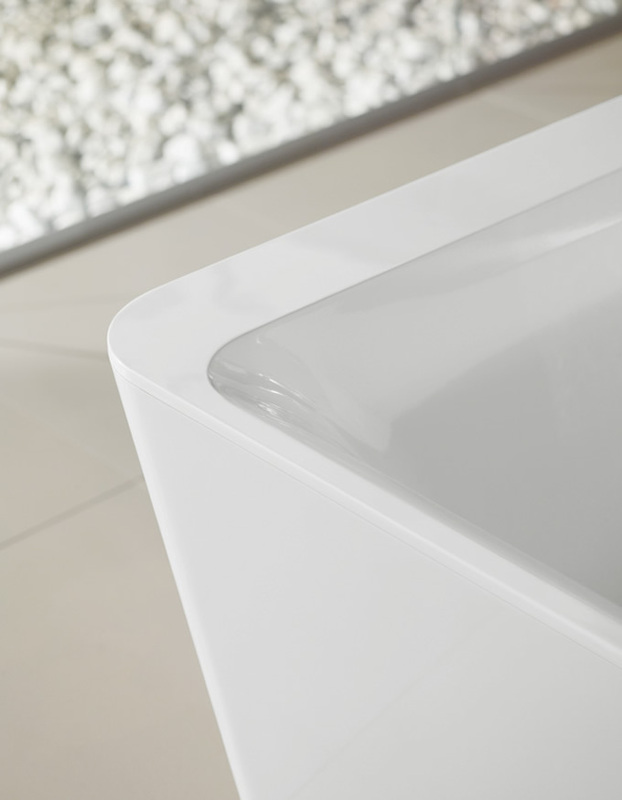 The new Squaro Edge 12 by Villeroy & Boch, an innovative new design in aesthetic bathtubs. Combining beauty with comfort, they provide the ultimate bathing experience, while making sure your bathroom takes centre stage. This new modern design is perfect for incorporating the latest styles and shapes in bathroom design, for luxury new developments, in Berkshire, Bucks or Surrey. The contemporary designs give modern, chic lines, and creates a light and airy feel. The Squaro Edge 12 uses a new material created by Villeroy & Boch which gives it a particular strength. Quaryl is made from quartz and acrylic, and is developed and manufactured specifically by V&B. The resulting element is versatile, durable and timeless, everything you could want to create the perfect bathroom designs. This flexible material allows for a rim width of just 12mm, as opposed to the 20mm rim that all baths previously had. This new minimal rim width gives the bath its sleek look, while maintaning that all-important level of comfort whilst bathing. The harmonious lines on the bath flow elegantly, with the flush fitting outlet and overflow that come in either white or chrome, highlighting the attractive aesthetic design of the bath. Whether you opt for a rectangular or oval built-in bath or a freestanding tub, make every bath feel like a special occasion. Its functionality combined with its truly show-stopping aesthetics has been recognised by one of the most prestigious awards- Villeroy & Boch’s Squaro Edge 12 is the winner of the 2014 Interior Innovation Award. This entry was posted in Luxury Bathrooms, New Products, Villeroy & Boch and tagged Edge 12 Bath, Squaro Edge 12 Bath, Villeroy & Boch, Villeroy & Boch's Beautiful Squaro Edge 12 Bath. Bookmark the permalink.